Perhaps little Ronnie Howard should forsake dramatic features and take up docs full time? 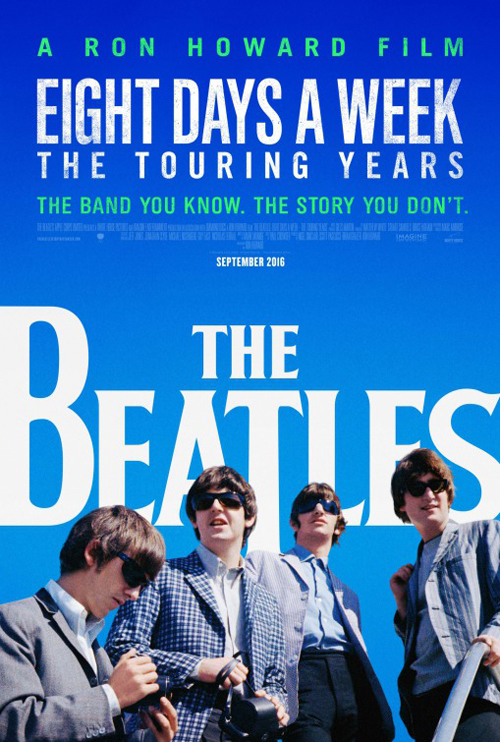 The Beatles: Eight Days a Week – The Touring Years isn’t the most ground-breaking of Beatles studies – indeed, most of its content is entirely familiar – but it’s resoundingly well put together (the occasional over-enthusiastic sound effect aside) and makes fine use of period footage, even of the sacrilegiously colourised kind (yes: now in full colour, but at least it sticks to the unhappy ending). Actually, perhaps because of how familiar this is – and I say that as a Beatles fan, rather than a buff, I don’t even know chapter and verse about Paul being dead, for example, so that tells you how non-dyed in the wool I am – some of the more interesting moments are the anecdotes from the great and good. There’s Eddie Izzard observing how they arrived fully formed in their ability to deal with hecklers (their instantaneous repartee in early interviews is always something to behold, and it’s interesting to see it give way to a more worn-down, exasperated demeanour), “a four-headed monster”, as McCartney describes. Then there’s Elvis Costello marvelling at their ability to play in tune at arena gigs (in particular the Shea Stadium, where most of the footage comes from), where they couldn’t hear anything (it’s noted that they had to play stadiums, as the fall out of having 5,000 tickets sold and 50,000 screaming fans outside would have been an injurious nightmare), and how the change that occurred musically with Rubber Soul took young Elvis some getting used to (now, everything prior to that sounds almost rudimentary, by their standards). Whoopi Goldberg talks about how they were colourless to her, which provides an appropriate introduction to their refusal to play Jacksonville under conditions of segregation. We take in the various landmarks, George’s growing dislike for playing live that spread amongst his fellows, and his issue that the music wasn’t being heard – it was “just a sort of freak show” – their filmic incarnations (A Hard Day’s Night as “a fantasy version of The Beatles” and Help – “In all truthfulness we spent a lot of that film slightly stoned”). It was the three months off for the third that never happened (there are no clips from the eventual Yellow Submarine here, but it’s the ultimate work by The Beatles, even if they were mostly played by other people) that further underlined their disenchantment with the merry-go-round of touring, finally having a chance to breathe and relax. There’s also John’s “bigger than Jesus” (“It was like the plot of Help had become real”) and the final footage of their last rooftop gig. Sigourney’s talking head is rather irrelevant, only there because the makers actually spotted her at the Hollywood Bowl. So no, nothing remarkable here, but accomplished and very easy and comfortable viewing. Little Ronnie wasn’t a stupendous fan, which probably serves his distant eye well, and the final credits audio effectively brings us back round to the premise of this feature, and the most crucial component of the Fab Four (“It was the music that was most interesting, that was important. And as long as we were going forwards and going somewhere, it didn’t matter”).